KANSAS CITY, Mo. — The Kansas City Chiefs began their offseason conditioning program Monday, although the amount of work amounted to meetings and some informal, players-only time on the practice field. Patrick Mahomes II has been doing all of that for months. The second-year quarterback has assumed the starting role following the offseason trade of Alex Smith to the Washington Redskins, and he has embraced it with aplomb. 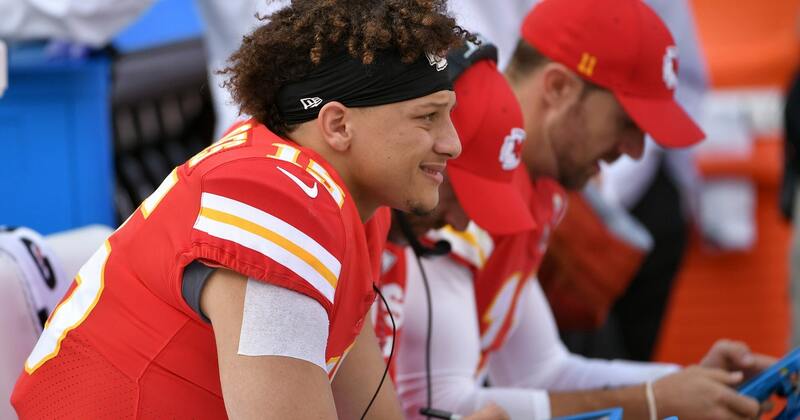 Mahomes had no problem summoning older, more experienced teammates for impromptu workouts at local high schools, and figures he threw passes to every running back, tight end and wide receiver on the roster at least once. Most guys dropped in for a couple of workouts when they were in town for other business, though a few — such as star tight end Travis Kelce — spent the majority of his offseason in Kansas City. Most quarterbacks around the league do similar offseason workouts with teammates, especially when there are new pieces in place. It takes time to establish the chemistry and timing required to run the modern spread offense, especially a system as complex and diverse as the one run by Andy Reid. What makes Mahomes unique is precisely what Kelce said: His age. Mahomes won’t turn 23 until mid-September, shortly after the season starts, making him one of the youngest players on the team. That must be balanced by the fact that he also plays the most important position. Yet it’s not as if Mahomes is a rookie being asked to resurrect a floundering franchise. After he was chosen 10th overall he got to spend last season learning under Smith, and then dazzled in a Week 17 start at Denver when the Chiefs already had locked up their playoff seed. Now he steps under center for the two-time defending AFC West champions, and with more talent around him than any Chiefs quarterback in recent history. He has the reigning NFL rushing leader in Kareem Hunt, Kelce, and a wide receiver group headlined by speedster Tyreek Hill that now includes downfield threat Sammy Watkins. The biggest challenge Mahomes could face is making sure everybody gets their touches. In other words, making sure everybody stays happy. But as numerous players filed through the Chiefs’ practice facility on Monday, those with a vested interest in getting their hands on the ball said that won’t be a problem. Kelce, Watkins and the rest of them gushed about the selflessness that exists in their new-look locker room. The defense is another matter entirely. There are questions just about everywhere after the release of veteran linebackers Derrick Johnson and Tamba Hali, the trade of cornerback Marcus Peters and the release of safety Ron Parker. Some of the spots have been shored up through free agency, including the signing of linebacker Anthony Hitchens, and the Chiefs are expected to fill others through next week’s draft. In the meantime, the guys already on the team have started their offseason work in earnest. Even if a few of them have been at it for a while.